As individuals age, not only do their bodies grow older, but also, their safety, health, and wellness requirements continually change. Living in a single-family home far away from relatives or loved Ones is acceptable in some situations, but it’s usually advantageous to be in a community with like-minded aging neighbors, state-of-the-art facilities, amenities and caregivers nearby. Canterfield of Ocala is a community that offers a continuum of care that follows the needs of their residents in a well-planned out environment. Canterfield of Ocala provides a neighborhood for independent living, assisted living, and memory care all within the same campus. As we age, it’s essential to make living accommodation changes for safety, health, independence, and dependent care needs. A care continuum makes it possible for individuals or couples to choose from a variety of environments and services as their healthcare needs change Over time. class assisted and memory care communities. As their residents’ age, if necessary, they can move from standard personal care to Canterfield’s memory care community. The Canterfield community offers residents the care they need throughout the process of aging. Because different care and housing options are available in the same residential setting, couples can continue to live together in light of their differing healthcare needs. This variety of options instills peace of mind where residents can experience optimal aging and have the security of being cared for throughout the process of growing older. Chef prepared options are endless at Canterfield. The world-class cuisine is inspired and imaginative to accommodate residents wants and needs. 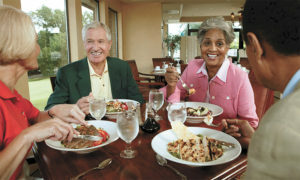 The dining dishes are exactly what you would find in a high-quality restaurant, but if a resident is craving a comforting turkey sandwich, or are following a special diet, the chefs are well-trained and always provide the freshest, most imaginable fare that is enviable of many fine restaurants. Chef Robert O’Brien began his career in culinary arts in the US Army in 1976. He spent several years in the military learning new culinary techniques abroad and in the US as a Staff Sergeant. When Robert finished serving our country, he started a new culinary career path in Tampa in a fine dining restaurant as a sous chef, learning from a master chef for 21 years. He relocated to Las Vegas, NV as a master cook and worked alongside numerous world-class chefs. After moving back to Florida, Robert put his extensive cooking experience to great use and began working for an independent and assisted living facility. Fast forward to today, and Chef O’Brien is using his 40 years of chef-inspired talents to serve Canterfield of Ocala, where he is able to bring world-class cuisine to the residents that he considers family. Canterfield of Ocala’s team of talented, compassionate nurses and personal care staff provide care 24-hours each day, seven days a week. They design a personalized and individualized service plan with each resident who receives personal care. Through the efforts of their Director of Nursing, care will be coordinated to include a full range of home health, physician and rehabilitation services, allowing residents to remain in the setting they now call “home.” To further ensure the continuity of meeting your healthcare needs, Canter-field has worked to establish relationships with hospitals, skilled nursing, and allied health services in the local area.